George Graham Reviews Fat Freddy's Drop's "Dr. Boondigga and the Big BW"
It's often interesting discovering music from places off the usual beaten path. Of course, the World Music scene, incorporating sound from Third World countries is a source of fascination and delight. But sometimes the far-away places can be the source of an interesting take on seemingly familiar music. A while back, on this series, we reviewed a recording by Zee Avi from Malaysia, who was a young rather folk-influenced chanteuse singer-songwriter. We also spotlighted The Hipstones, a kind of laid-back funk and blues band from Australia. This time, we have another group from Down Under who do a distinctive and quite original mix of funk, soul, reggae with some electronic grooves, along with a horn section and mellow vocals. 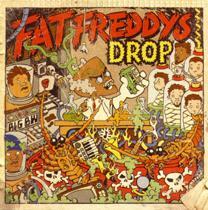 The group is called Fat Freddy's Drop, and they hail from New Zealand. New Zealand has been the source of a few bands popular in the US over the years, with the best-known probably being Split Enz who had some hits in the late 1970s in to the 1980s. Tim and Neil Finn of the band Crowded House, were also from New Zealand, and more recently, the reggae band Katchafire has achieved a good deal of international popularity. Fat Freddy's Drop was formed in the capital city Wellington in 1999. They are a seven piece group who had been performing and put out a series of singles and videos before the release of their debut album called Based on a True Story in 2005. They soon achieved popularity in their home country, and Based on A True Story became the highest-selling independent release in New Zealand, going the Kiwi equivalent of eight-times platinum. Since then, the band released some live recordings and videos, but are now out with their second full-length studio album called Dr. Boondigga and the Big BW. It was released in New Zealand in 2009, and is now out in the US, after the band has been attracting some attention on this side of the globe. They have toured Europe, and recently ventured to perform some California gigs. Their lead vocalist Chris Faiumu is quoted as saying "One of the upsides of being far away from the action and not having to deal with the weight of a strong musical history is that we don't feel we have to stick to one particular style or approach." And that eclectic direction definitely marks Fat Freddy's Drop's music. There is a confluence of 1960s soul-style vocals, danceable beats that run between reggae and some electronica, plus a horn section who can mellow out quite a bit. The horns sometimes provide a considerable textural contrast from the often strong rhythmic drive. The rhythms themselves are an interesting mix, not easily falling into any category for very long. And the smooth soul-style vocals form a juxtaposition to when the music's rhythm moves toward hip-hip influenced, when one might expect a rap-style vocal. The nine, mostly lengthy tracks cover a lot of ground on this generous 69-minute long CD. Dr. Boondigga and the Big BW, the new second album from the ten-year-old New Zealand band Fat Freddy's Drop, is a creative and distinctive recording that mixes familiar and popular ingredients in clever and sometimes unexpected ways. It's definitely danceable, but the music is a series of contrasts, between the classic soul-style vocals with the beats that run from electronica to hip-hop to reggae and ska. While sometimes the band can get stuck too long in a groove -- which is OK if you are actually planning to dance to it -- for the most part, the septet keeps things interesting with their conglomeration of influences. The musicianship is first-rate, and the compositions, while not particularly profound lyrically, are intelligent and musically clever. Our grade for sound quality is close to an "A." There's a lot of studio tricks going on, but for the most part it's tasteful, and the dynamic range is better than expected due to less heavy-handed volume compression than is typical for this kind of music in these days of mindless loudness wars on CDs. For the commercial music world, New Zealand may be rather far off the beaten path, but Fat Freddy's Drop have put that to their advantage in their unabashed eclecticism on their new CD.